If you ever played with Icon Cast. You know that it is about two things - icons and colors. Thus most of our effort goes in these directions. What we have learned is that a lot of icons from Icon Cast end up in web apps and prototypes. And from time to time you want to match the other colors on the website. Colors of most elements on the website are unsurprisingly in CSS. CSS is very flexible in a way you can define color. You can use good old HEX code, individual RGB+Alpha values, HSL (hue, saturation, brightness) values or even some predefined CSS color names. So in the hex field try examples such as "#f00", "rgb(255,255,255,255)", "Black", "LIME", "hsl(240,100%,50%)". 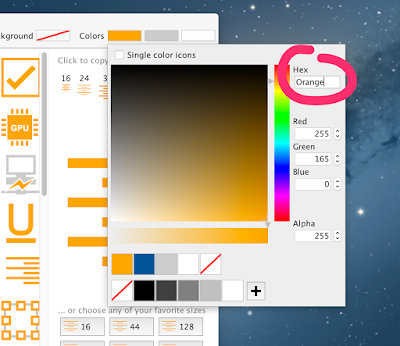 We now support pasting any valid CSS color value into the "Hex" field. It is more powerful that it claims :) A small hidden gem.